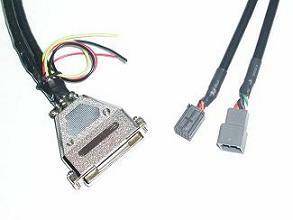 This is the vehicle-specific X3 T-harness and brain module that connects to the vehicle's audio system. The X3 system includes a Selector Brain Module (included), wired Remote Selector Box (included), and vehicle-specific T-harness (included) for your audio systems. The Selector Brain Module has three pairs of gold-plated RCA inputs for connecting devices such as: iPod; Digital Satellite Receiver; DVD player; VCR VCP; PlayStation; MP3 player; portable MiniDisc; portable CD; portable DVD w/built-in monitor. The wired Remote Selector Box can be hand-held or mounted anywhere on or near the dash for ultimate convenience. 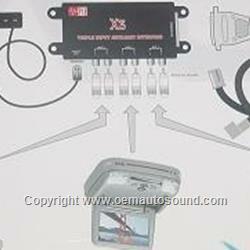 The Remote Selector Box has a single push-button switch to select between three auxiliary sources and the CD changer. Status LEDs on the Selector Box indicate which source is selected (AUX 1, AUX 2, or the CD changer) -- convenience in the extreme! Now you can switch between auxiliary sources at will! The X2 Auxiliary Input Selector allows the user to add up to three auxiliary input sources, connected directly between the CD-changer and factory audio systems. The X3 interrupts the audio of the CD-changer, switching between three user-selectable RCA level auxiliary sources, and defaults back to the CD-changer if desired.The X3 switchable Auxiliary Input Selector accepts three auxiliary input sources with a CD-changer present!